$12.222 million on 3276 screens. With 2011’s Arthur, we find an update on the 1981 hit. Super-wealthy Arthur Bach (Russell Brand) lives life like a child – a drunken child, that is. He drinks to excess and ignores any semblance of responsibility. Push comes to shove, however, when his mother Vivienne (Geraldine James) pressures him to marry Susan Johnson (Jennifer Garner). Vivienne wants Susan in the family to placate the family business’s shareholders; they’ll feel better with the savvy Susan as the heir apparent. Arthur can’t stand her but agrees to wed Susan when his pop threatens to cut him off from all the money. Arthur’s life changes he meets Naomi Quinn (Greta Gerwig) at Grand Central Terminal. She runs illegal tours of the station and runs afoul of the law for the umpteenth time. Arthur contrives to help get her out of this and becomes smitten. A relationship with Naomi excites Arthur, and he enjoys his time with her. However, family pressures continue to frown on this and push him toward a loveless marriage with Susan. What will Arthur choose: his money or his love? While the original Arthur soared at the box office, the 2011 version tanked. Was this because fans didn’t want to see an update of the story, Brand wasn’t an appealing substitute for Dudley Moore, or the idea of the “lovable drunk” isn’t all that lovable anymore? I don’t know, but I can say that in my opinion, the remake tops the original. Granted, that doesn’t mean a lot, as I thoroughly disliked the 1981 movie; I felt it provided a grating, unfunny experience with little charm or cleverness, so it came with ample room for improvement. The 2011 version indeed betters the 1981 in virtually all areas. In particular, the new flick better explains character motivations and related story elements. We understand why Arthur’s such a sot, and we comprehend why Susan wants to be with him. The last area was especially problematic in the 1981 flick, as it never made sense that Susan felt so in love with Arthur; the remake explains the rationale for the proposed marriage in a much more satisfying manner. The cast create more satisfying performances as well. That may seem like sacrilege given how beloved the work of Moore and John Gielgud appears to be, but I wasn’t wild with their acting. Helen Mirren gives the Hobson role the appropriate edge but adds more humanity; Gielgud’s Hobson simply came across as mean-spirited too much of the time. Brand seems to be a polarizing performer, and I can’t say I’m a big fan, but I think he makes a better Arthur than Moore. In Moore’s hands, the character was a grating buffoon. Brand goes down that path to a degree, but he imbues the role with a layer of intelligence absent in Moore’s goofball. We actually kind of care about the Brand Arthur, while the Moore one became an annoyance. The biggest improvement comes from the presence of Gerwig. Actually, I don’t think she’s all that great, but she’s a tremendous step up from Liza Minnelli. Not only was Liza irritating as hell, but also she just wasn’t very attractive. It never made a lick of sense that Arthur would fall for Liza’s character, whereas we can comprehend Gerwig’s appeal. None of this makes Arthur a great – or even especially good – movie, but it delivers some entertainment. It’s hard to say how I’d view it if I’d not seen – and disliked – the original recently, though I suspect that if the 2001 edition existed in a vacuum, I’d find it to be fairly ordinary. Which it is, so don’t take my relative praise as a strong endorsement. Nonetheless, the 2011 has some charm and humor involved, and it’s a pleasant enough experience. At the very least, it’s a substantial improvement on the miserable original film. Arthur appears in an aspect ratio of approximately 1.85:1 on this Blu-Ray Disc. Though not killer, this was usually a satisfying presentation. The film delivered good clarity. A few shots seemed a bit on the soft side, but those were mild. Most of the film looked concise and well-defined, however. No issues with jagged edges or moiré effects occurred, and edge enhancement was absent. I also failed to detect any source flaws. In terms of colors, the movie featured a natural palette that favored a slight golden tone. Across the board, the hues looked positive. They showed nice clarity and breadth and came out well. Blacks were dark and deep, while shadows appeared clear and smooth. I thought the movie consistently looked strong. I thought that the DTS-HD MA 5.1 soundtrack of Arthur seemed fine but it didn’t excel because of a lack of ambition. Like most comedies, the movie featured a limited soundfield that strongly favored the forward channels. It showed nice stereo spread to the music as well as some general ambience from the sides. Panning was decent, and the surrounds usually kicked in basic reinforcement. A few scenes opened up better, but not with much frequency. This meant that most of the movie stayed with limited imaging. Only a few extras round out the set. Arthur Unsupervised gives us an 11-minute, 17-second featurette that provides comments from director Jason Winer and actors Russell Brand, Jennifer Garner, Helen Mirren, and Greta Gerwig. They tell us about all the improvisation on the set and let us see many examples of alternate lines and gags. The tone remains pretty fluffy, but it’s fun to see the unused bits. A Gag Reel runs a mere one minute, 22 seconds. Expect the standard array of mistakes and silliness. Mirren does deliver a naughty alternate line from a children’s story, but the rest is forgettable. Seven Additional Scenes fill a total of 10 minutes, 21 seconds. These include “Remember the Komodo Dragon?” (1:23), “Stung By Love Wasps” (3:42), “The Walk to Naomi’s” (0:52), “Employment Office Meltdown” (1:37), “Dressing for Anonymity” (0:46), “Apology Breakfast” (0:55) and “I’m a Slippery Eel” (1:05). Most of these deliver extensions of existing scenes, so we don’t get much that stands out as unique. The segments pad elements of the movie to a moderate degree but don’t contribute much; they’re fun to see but inconsequential. A second platter provides both a digital copy of Arthur for use on computers or digital portable gadgets as well as a DVD copy of the film. This delivers a barebones package, so don’t expect any extras. 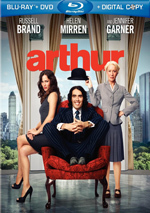 On its own, 2011’s Arthur offers a moderately amusing comedy. It’s not great, but it does work a whole lot better than the surprisingly awful 1981 original. The Blu-ray provides very good picture, acceptable audio and a small set of supplements. This isn’t a great film, but it’s reasonably enjoyable.